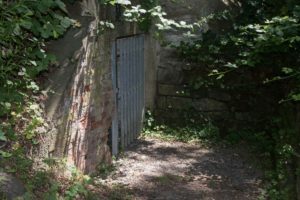 Concept and places of Interest – KZ-Gedenkstätte Vaihingen/Enz e. V.
On a runway over the listed foundations of the former desinfection hut visitors get access to the monument. Today it is overbuilt by a hall which includes the centerpiece of the memorial – the media installation. In the vistors and information centre the basic information for understanding the historical context is provided. 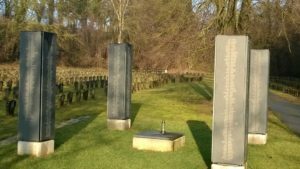 The concentration camp cemetery with the name plates on the former site of the common graves is another important location for commemoration within the memorial. All in all there are five main places of interest which make up the memorial. To get an overview just click here . With the help of a model of the camp the original site, structure and size of the former camp in the topographically modified Glattbach valley can be reconstructed. A time line and other printed information material put the basic information to comprehend the historical context across to the visitors. The listed foundation of the former disinfection hut can be reached on a runway. 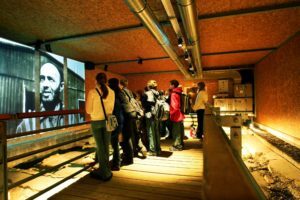 Today it is in a sheltered and shaded hall in which the audio visual media installation is presented. The twenty – minute video collage made up of quotations of former inmates, music, defamiliarized and crossfaded pictures and noises should provide an emotional access to history, especially to the cruel fate of the inmates. The area remains shaded, only at certain passages the foundations are included in the presentation with light effects. Here temporary exhibitions which present single aspects of the topic can be found. 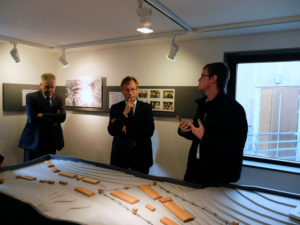 One example is the exhibition´From common grave to concentration camp cemetery´ produced by the youth group HiSTORIES. Originally it was blasted out of the rock by the inmates to give the SS–guards shelter during bombings. It is the last visible testimony of the inmates` labour. In 1958 the concentration camp cemetery was opened on the former site of the 13 common graves. There 1342 victims rest in peace anonymously. The cemetery with its four name plates which were erected in 2013 is the true location for commemoration and sorrow. Around the date of liberation (April 7th) of the camp the commemoration ceremony is held there in April each year. On the name plates which were erected in 2013 1342 victims´names appear in alphabetical order. Eleven victims stay anonymously.